1. I'm not a mom to little ones (yet...10 weeks and counting! ), but this article really spoke to me. Those close to me are well aware of my "problem" that comes from trying to do too MORE all the time and I loved the message here. Do. Less. Stuff. This has actually been my intention throughout pregnancy and while I think I've done a pretty good job of it, I really want to maintain that sentiment throughout the Christmas season! I figure the more I practice it now, the easier it'll (hopefully) be once Baby McLaury is here! 2. I don't accept every giveaway or offer that comes my way via the blog. In fact, I turn down far more than you'd think! However, I was intrigued when La Terra Fina offered to send me a few samples of their products, mostly because they offered to throw in vegetable dip, and I'm always looking for ways to con myself into eating more vegetables...particularly when I pack lunches for work. 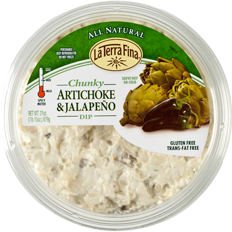 I've sampled the Chunky Artichoke and Jalapeño dip as well as the Spinach and Artichoke dip and can't really pick a favorite between the two. They're great to eat with vegetables or crackers, but I'd also love to try experimenting by using it as a sandwich spread. They also have some new Greek yogurt-based dips that I'm dying to try, though rumor has it these are less widely available right now. We also tried one of their quiches, and although it's unusual for us to eat a packaged meal for dinner, this is a great option for when baby comes and we were pleasantly surprised by how fresh it tasted! Totally hit the spot after a long day of work when I didn't feel like cooking! Want to try for yourself? La Terra has offered to give one reader the two dips we tried as well as a quiche. Enter to win by leaving a comment on this post telling me which of the La Terra Fina products you're most interested in! I'll pick a random winner on Tuesday at 9 pm Central and contact the winner via email (make sure you leave an email address). Update: Commenter #5, Erin, was who Random Number Generator picked and she's been contacted! In case you don't win, see where you can buy their products here (Looks like Costco is a main seller...good thing my father-in-law is always willing to make a Costco run for us ;)). 3. Recognize the above? 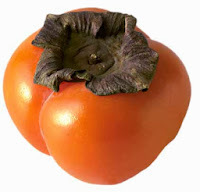 That is a persimmon, better known as our obsession this time of year. If you've never tried these sweet fruits, hunt them down at your grocery store! Speaking of my father-in-law, and Costco (see #2), the wonderful man treats us to the 8-pack from Costco from time to time and we savor each one of those babies. 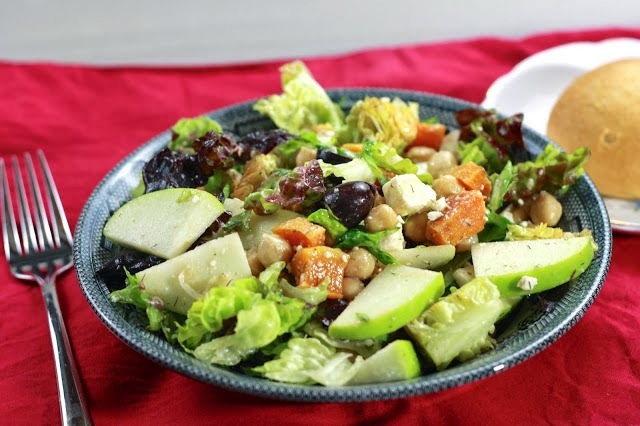 They're great all on their own, but we've been known to throw them in salads too! 4. Looking for a lighter dinner to balance all those extra-treats you're enjoying now that the Holiday season is kicking off? Don't forget about this chopped winter salad with roasted squash, apples, and feta!